The Dow Jones Industrial Average declined 2.2% in 2015, its first negative return year since 2008. 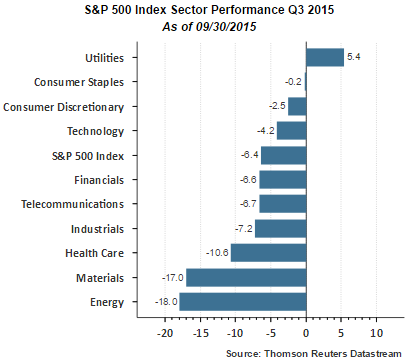 The S&P 500 Index fell .7% and the Nasdaq posted a positive 5.7 return for the year. Several interesting phenomenon occurred in 2015: narrow market breadth, strong outperformance of growth stocks versus value stocks and strong performance of the FANGs (Facebook (FB), Amazon (AMZN), Netflix (NFLX) and Alphabet or Google (GOOG)). For the year the average return of the FANGs equaled 77.2%. 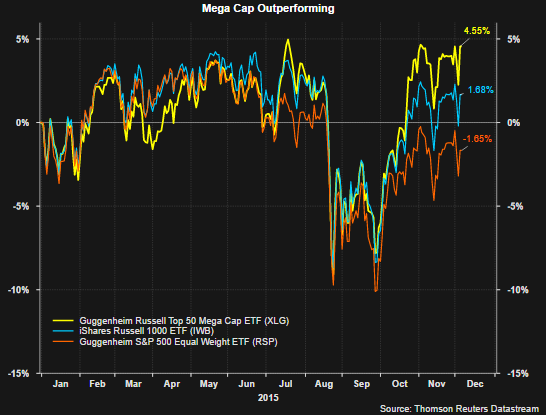 Looking at returns a little more broadly, yet highlighting the narrow market leadership, the average return for the top 10 stocks in the S&P 500 Index by market capitalization were up 25.9%, while the average return of the remaining 490+ were down 1.1%. 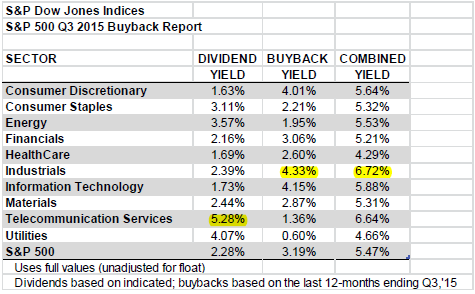 Below is a chart noting the 2015 return (not average return) for each respective index. Style Index Series: This series divides the complete market capitalization of each parent index approximately equally into growth and value indices, while limiting the number of stocks that overlap between them. This series is exhaustive (i.e., covering all stocks in the parent index universe) and uses the conventional, cost-efficient, market capitalization-weighting scheme. Pure Style Index Series: This series is based on identifying approximately one quarter (1/4) of the market capitalization of the index as pure growth, and one quarter (1/4) as pure value. 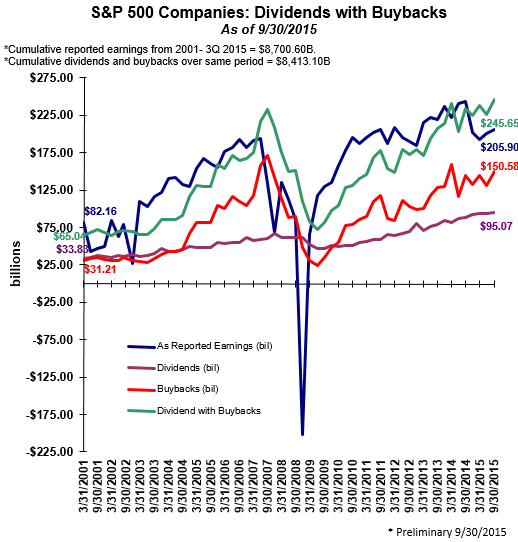 There are no overlapping stocks and stocks are weighted by their style attractiveness. 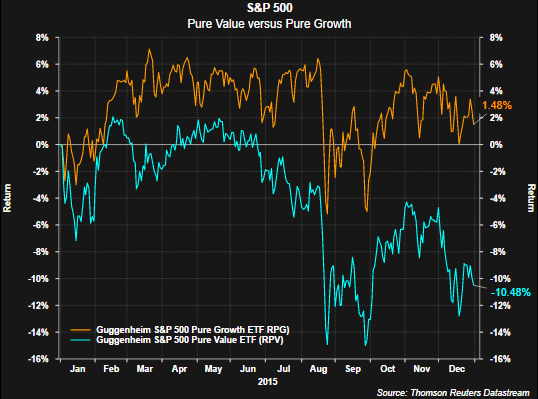 As can be seen in the below chart, the S&P 500 Pure Value Index is down nearly double the S&P 500 Value Index for 2015. 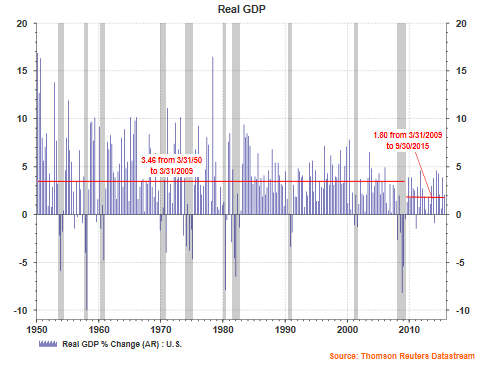 The complimentary pure growth index has generated half the return as the S&P 500 Growth Index; however, the absolute magnitude of the difference is not large. 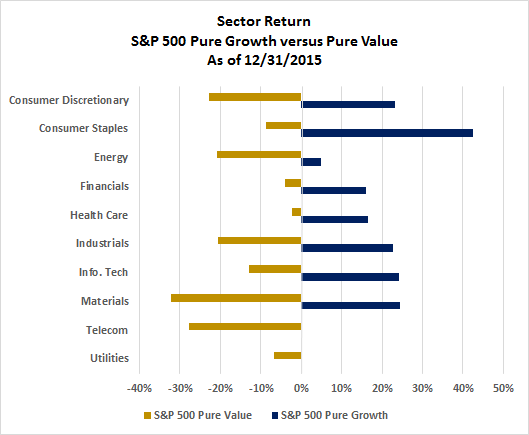 Lastly, the two charts below show the average sector returns for the growth/value and pure growth/pure value styles. Again, because the pure growth and pure value styles eliminate any overlap between the two indexes, the differing sector returns is clearly visible. 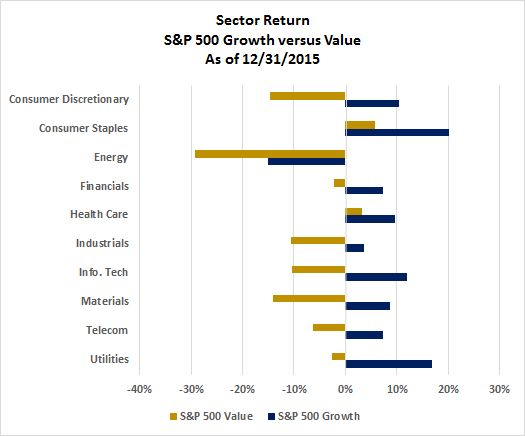 For the S&P 500 Pure Value sectors, not one sector has an average return that is positive for 2015. 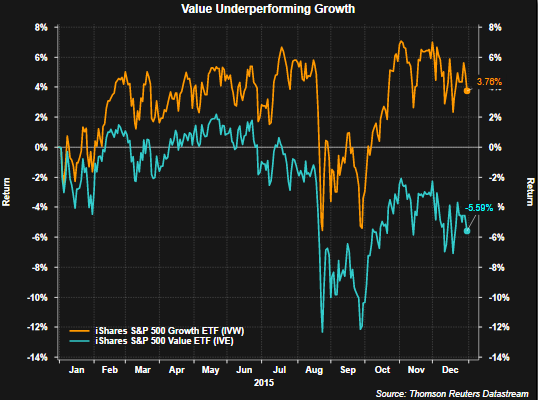 This simply speaks to the significant outperformance of growth versus value in 2015. As 2016 gets under way, the significant disparity in growth versus value will be one factor investors will want to evaluate. 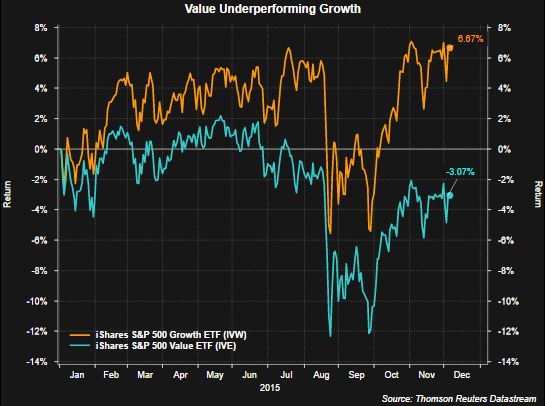 Value type equities certainly look attractive from a valuation perspective; however, the slow pace of economic growth, both in the U.S. and abroad, have weighed significantly on value stocks. Additionally, energy oriented equities account for three times as many names in the value index and the weak returns in this space have been well written about this year. In the coming week we will have more perspective on our views for 2016. 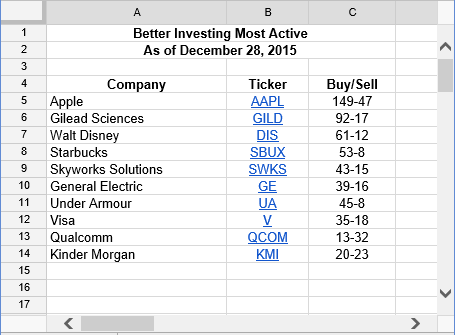 The below list details the most active stocks reported by Better Investing members. Better Investing members continue to show buying interest in Apple (AAPL). Since my last update of this list in November, General Electric (GE) and Kinder Morgan (KMI) are new additions while Netflix (NFLX) and Johnson & Johnson (JNJ) have fallen from the top 10. Stocks in Energy Master Limited Partnerships (MLPs) have experienced some of the worst declines of any sector this year. The below chart of the Credit Suisse X-Links Cushings MLP Infrastructure ETN (MLPN) is a clear example of the magnitude of the decline. From the ETN's high to its low this year, the ETN fell over 52%. In less than a month, and mostly the past week, MLPN has rebounded 19% yet remains 43% below its 52-week high. Given the magnitude of the decline in MLPs investors are evaluating whether this is an opportunity to begin building positions in the asset class. One decision point revolves around technicals while the other is centered in evaluating the fundamentals of many MLPs themselves. 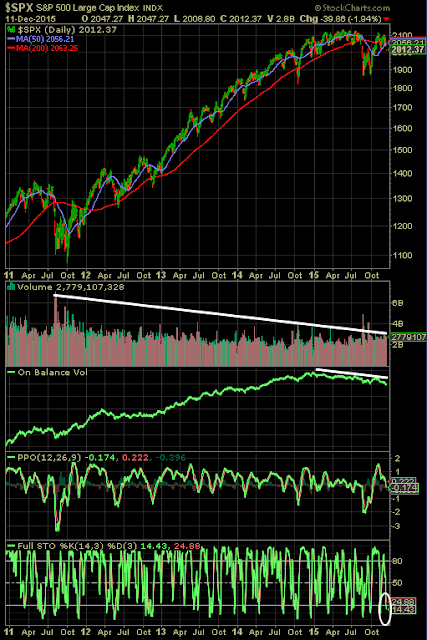 Technically, the recent bounce in some MLPs is placing them near short term overbought levels. In my view it will be the fundamentals that drive the future long term returns of the asset class and it is here where the waters become a little murky. 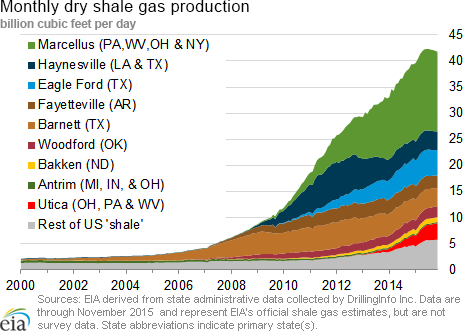 The growth of shale fracking has been a game changer for the natural gas and overall energy market in the U.S. 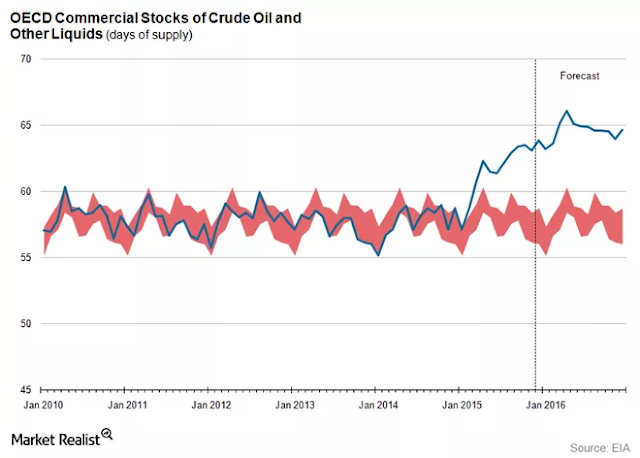 The over supplied levels for both gas and oil has been written about ad nauseum this year, but suffice it to say the U.S. has abundant supplies of energy resources in the near term. The consequence for exploration and production (E&P) MLPs is the increased supply is resulting in lower prices for their product, thus pressuring margins. Historically, the safe plays in MLPs were the midstream companies that essentially transported the product from the well head and then paid a toll based on the volume of oil/gas transported through their pipelines. Therein lies one question, if the E&P companies produce less, will less be transported by midstream MLPs, thus negatively impacting the revenue of the midstream MLPs? Two additional issues are facing MLPs broadly that are related. As noted above a part of MLP growth has come from the booming natural gas segment, largely a result of shale fracking. In order to handle the growth, MLPs have increased their capital expenditure budgets and financed the expenditures via both equity and debt funding sources. This has occurred at the same time MLPs have strived to grow their distributions to shareholders. Given the challenges facing many of the E&P MLPs, a few have cut distributions in order to funnel cash flow to capital expenditures due to the inability to access the credit markets without facing potential credit rating downgrades. Additionally, some of these MLPs have resisted issuing equity at these lower stock price levels due to the increased dilutive impact to existing shareholders. 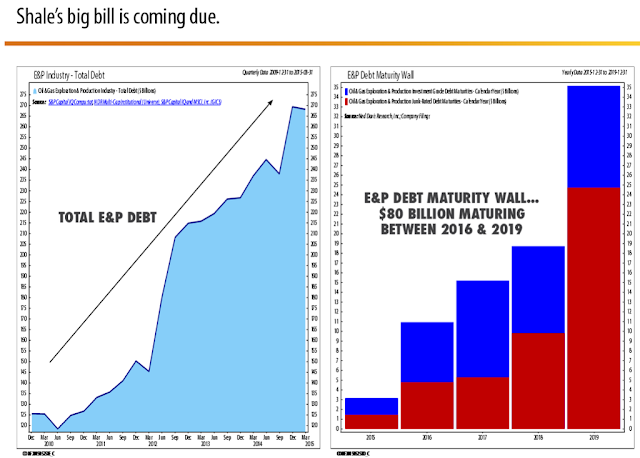 Also, the E&P companies will be facing an increasing need to roll over maturing debt. One midstream oriented MLP index is the Cushing MLP Infrastructure Index and all but one MLP in that index has a debt to EBITDA ratio greater than 2.6. 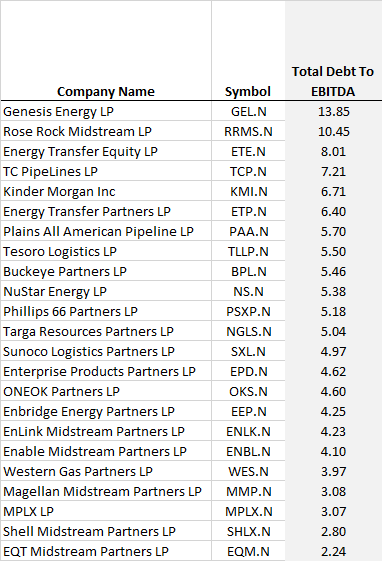 Half of the MLPs have debt/EBITDA ratios greater than 5.0 and several are double digits. The next question is what level of financing will be needed going forward to fund growth? The above file contains detail on cash flow from operations versus capital expenditures. In total, the gap that needed to be funded in 2015 with debt or equity is in excess of $11 billion. I also included a more detailed quarterly cash flow report for Energy Transfer Partners (ETP) in order to provide readers with insight into the funding sources and uses of cash by the company. A number of midstream MLP's have similar funding source breakdowns between equity and debt issuance. As noted earlier in this post, debt is likely to be a more restrictive funding source, so equity is the alternative. With MLP prices depressed, MLP’s are less likely to issue equity due to the level of dilution. The alternative is to cut cap ex, cut the dividend or a combination of the two. Given the market’s negative reaction to recent distribution cuts by several MLPs, managements at MLP companies are likely to take a harder look before cutting distributions and more likely focus on cap ex first. 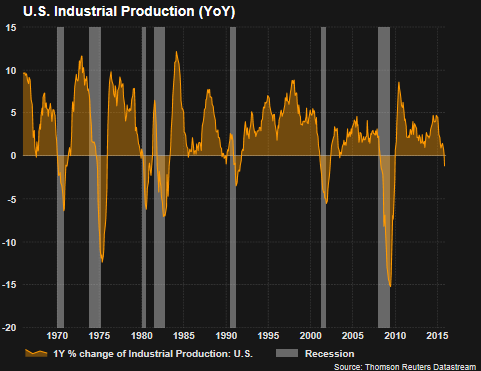 Cutting capital expenditures has the potential negative impact of constraining future growth; however, this is likely what is needed given the U.S. energy glut. the first article below on how to profit from a rise in oil prices. article #5 on the list detailed issues we believed the market needed to resolve in order to generate strong returns this year. Some of the issues we outlined then, like weakness in high yield bonds, have risen to the top of investors minds as the year is coming to a close. the last article in the list evaluated the significance of the death cross and how the trigger might be most useful in one's decision making process. Over the course of the next several weeks we will provide a more comprehensive review of 2015, and more importantly, our outlook for 2016 which will also be included in our Winter Investor Letter. 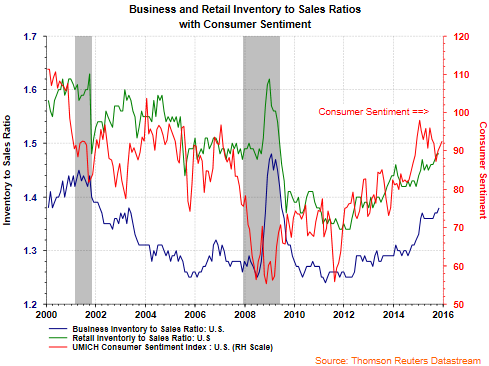 The business inventory to sales ratio and retail inventory to sales ratio are above or near levels last seen prior to the last recession. In an article in the Wall Street Journal ($) this morning it was noted, "Sales at physical stores fell 6.7% over the most recent weekend, while traffic declined 10.4%, according to RetailNext, which collects data through analytics software it provides to retailers. That is worse than the 5.8% decline in sales and the 8% drop in traffic recorded from Nov. 1 through Dec. 14." This build up in inventory at the retail level as well as in the pipeline, likely results in brick and mortar retailers offering significant discounts after Christmas. The major challenge for brick and mortar retailers is the consumer's desire to shop online. Data through the third quarter reflects the growth in online purchases. The continued popularity of online shopping is a challenge brick and mortar retailers will not easily resolve. Investor attention at the end of last week's trading was focused on the sharp sell off in high yield bonds, better know as junk bonds. This sell off was precipitated by the firm, Third Avenue, restricting redemptions on its Focused Credit Fund. Subsequent to Third Avenue's announcement, Stone Lion Capital Partners L.P. said it suspended redemptions in its credit hedge funds due to the high level of redemption requests it has received. 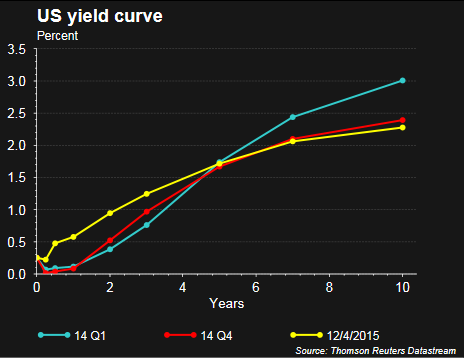 Many stories have been written about the events impacting the high yield bond market, here and here. In reality, a better classification for the Third Avenue Focused Credit Fund is probably a distressed debt fund or special situation fund. The fund's "focused credit" reference means just that, the fund is highly concentrated with nearly 30% of the fund's assets invested in its top 10 bond holdings. In other words, the fund is not a diversified bond fund. 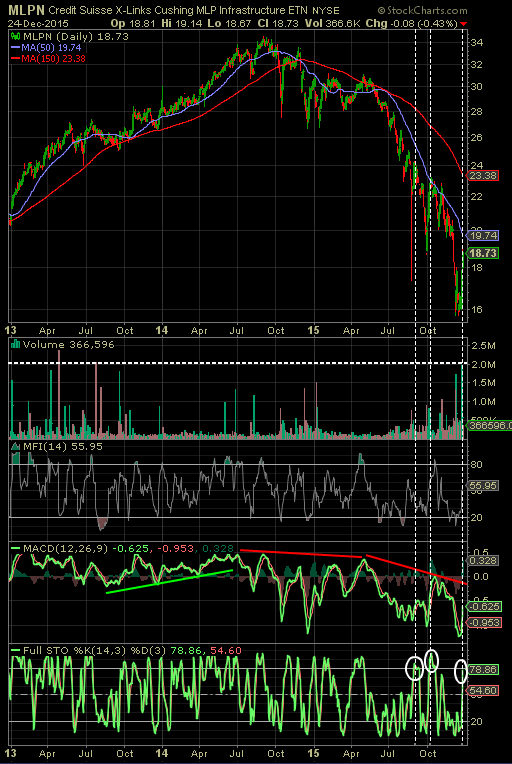 Our clients know we eliminated our high yield bond exposure in July of 2014. One reason we sold the high yield exposure last year was due to the narrow spreads on high yield broadly as reflected by the red dot in the below chart. This tight spread characteristic is an indication of the rich valuation of the high yield asset class at that time. The issues surrounding high yield are being felt in the equity market as high yield bonds and stocks are highly correlated. Last week the Nasdaq declined 4.1% with the S&P 500 Index and the Dow Jones Industrial Average both declining 3.8% and 3.3%, respectively. For the year both the Dow and S&P 500 Index are essentially flat for the year on a total return basis while the Nasdaq remains up a little over 4.0% year to date. On a price only basis the S&P 500 Index is down 5.6% from its high in May. The pullback last week has resulted in the CBOE Equity Put Call Ratio spiking higher to .92 as can be seen in the chart below. 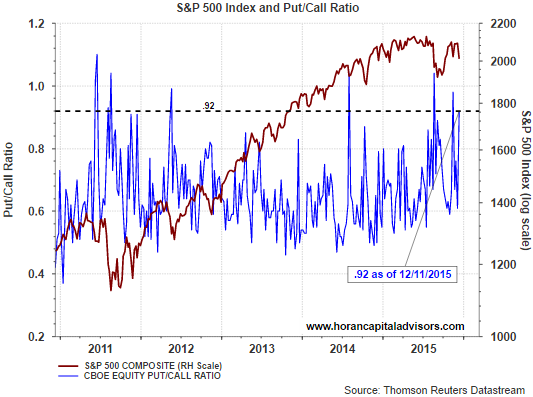 As I have noted in earlier posts, P/C ratios over 1.0 are representative of an oversold market. 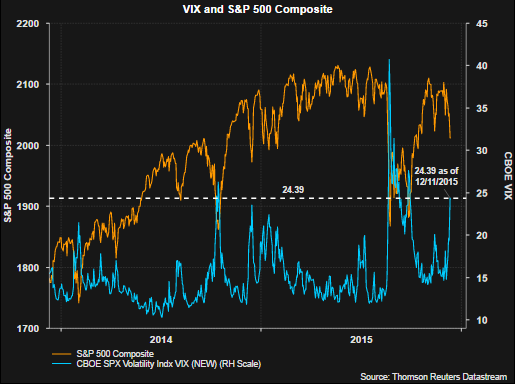 The second chart shows the VIX index and this fear measure has also jumped higher to 24.4. Readers can track these fear measures here. One near term concern we discussed in a mid-November post was the fact the On Balance Volume indicator (OBV) continued to show more trading volume on down days than on up days. This has been the case all year and has resulted in a downward sloping trend for the OBV a noted by the second white line in the below chart. From a positive perspective some technical indicators are beginning to look more favorable (CBOE P/C ratio noted earlier), but also indicators like the Full Stochastic Indicator below. The risk developing in the junk bond market is a consequence of the Fed's extended near zero interest rate policy and investors feeling the need to reach for yield. Similar challenges have developed in the energy Master Limited Partnership (MLP) space. The belief is the Fed desires to begin removing the proverbial bunch bowl and raise interest rates at the conclusion of next week's Fed meeting. I suppose it is possible the recent issues facing the bond market could result in the rate increase being pushed into early next year. Many of the headlines over the weekend were bearish ones with valid concerns about the high yield bond issues spreading into other areas of the market. On the other hand, this week's Barron's cover story highlighted 2016 forecast by ten strategists and all ten predicted higher equity returns for next year, with the average equaling 10%. With the issues facing the high yield bond market and a potential Fed rate hike around the corner, higher volatility in equities could face investors as the year nears its end. If this volatility is on the downside, Baron Rothschild, a member of the Rothschild banking family, is created with saying, "Buy when there’s blood in the streets, even if the blood is your own." Today, a number of media outlets have been discussing the disappearing middle class. The report was released by the Pew Research Center and notes, in 2015 21% of households comprise the top two income tiers, with Pew defining as more than twice the nation’s median income or at least $126,000 a year for a three-person household, which is up from 14% in 1971. For the bottom two income tiers, a three-person household earning $42,000 a year or less, in 1971 25% of households were in the lower two earning tiers versus 29% in 2015. The media outlets failed to provide detail around the cause behind this change. Below is select commentary from the website Political Calculations and the author's article, Solving the Mystery of the Disappearing U.S. Middle Class, which provides detail behind this shrinkage in the middle class. With the ranks of both the lowest and highest income earning American households simultaneously increasing as the ranks of middle income earning Americans have become depleted. But who were the biggest winners and losers?" "The biggest winners since 1971 are people 65 and older. This age group was the only one that had a smaller share in the lower-income tier in 2015 than in 1971. Not coincidentally, the poverty rate among people 65 and older fell from 24.6% in 1970 to 10% in 2014. Evidence shows that rising Social Security benefits have played a key role in improving the economic status of older adults. The youngest adults, ages 18 to 29, are among the notable losers with a significant rise in their share in the lower-income tiers." "What the Pew Research Center's analysts were seeing in the 'hollowing out' of the U.S. middle class wasn't the result of some nefarious cause, but rather the inevitable result of the changing age demographics of the U.S. population. More specifically, the differences in the size of the living population of the U.S. by generation. 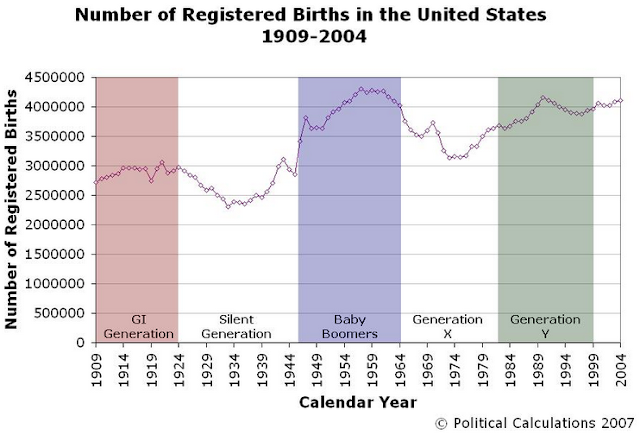 The chart below shows the number of Americans born, whose births were registered, in each year from 1909 through 2004, while also indicating their generational grouping." 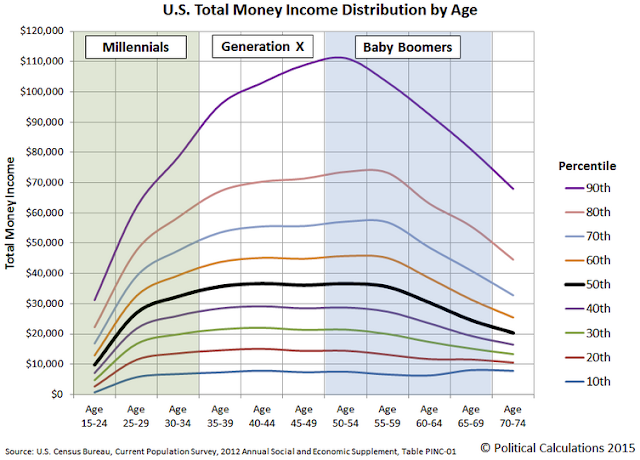 The next chart below provided by Political Calculations shows the income distribution by the last three generational groups. "What we see is that Baby Boomers, who would be Age 51 to Age 69 in 2015, occupy the ranks of the highest income earners in the U.S., while Millennials, who would be Age 16 to 33 in 2015, occupy the ranks of the low end of the income earning spectrum." "Meanwhile, we see that the much smaller Generation X finds itself sandwiched between these two larger generations in the ranks of the middle class." 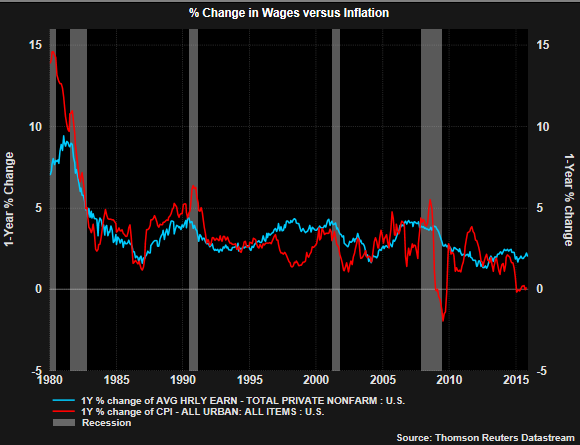 "Is it really any wonder then that the number of middle class households has shrunk as it has while the apparent income inequality among U.S. households has increased?" "The mystery of the disappearing U.S. middle class is solved - the apparent movement of Americans toward the "economic extremes" is primarily the result of the changing age demographics of the U.S. income earning population (emphasis added)! Now, if we could just get a better class of journalists to dial down their overly excited and poorly considered emotional hyperbole...."
Additional detail can be found by reading the entire Political Calculations article.